Koch, the patron. Koch, the tyrant. The story that has emerged this week was disheartening. Billionaire industrialist Charles Koch, known for huge campaign donations to candidates, think tanks, advocacy groups, and in campaigns like California’s Proposition 32 last year, had been a powerful influence in the derailing of a documentary critical of his role in the post Citizen’s United political landscape. The film, “Citizen Koch”, received scrutiny after an unprecedented level of interference with a documentary that aired last year about the uber-rich that involved Charles Koch and the leadership at the largest public television affiliate, New York’s WNET. It is to be expected, as PBS and related groups receive less government funding and must make up the difference through private and corporate donations. In a more benign way, much content on public TV already appeals to the white well-to-do funding base of most affiliates. However, if public television cannot act in the public interest due to the strings that come attached with its funding, it quickly becomes irrelevant. If it’s driven by cash and pandering, it’s no different than for-profit network and cable television. Not to say that this documentary is the greatest thing ever made- have not seen it, can’t judge. But the shifting treatment that the filmmakers received as time went on indicates that the change of heart was motivated by external forces. The issue isn’t so much Charles Koch but WNET. Its importance and influence keep other PBS affiliates hostage, and since their main sources of funding are incredibly wealthy individuals, their interests are the first to be considered. Author Andrew MackayPosted on May 24, 2013 May 24, 2013 Format LinkCategories Media, PoliticsTags censorship, charles koch, citizen koch, documentary, freedom of the press, koch, koch brothers, park avenue, PBSLeave a comment on Koch, the patron. Koch, the tyrant. What is equality really about? As you likely know even if you don’t follow professional sports, veteran NBA center Jason Collins has come out as gay. He’s the first active member of a major sport to do so. Openness may not completely disarm prejudice, but it’s a good place to start. It all comes down to education. I’ll sit down with any player who’s uneasy about my coming out. Being gay is not a choice. This is the tough road and at times the lonely road. Mainstream society currently views gay rights and gay marriage as synonymous, and focuses more on marriage than any other aspect of gay life. As some of my queer friends have pointed out, the march to equality moves far beyond marriage. Not all gay people want to get married, or think that marriage is a good institution to promote. Society is slowly pivoting to gays being part of the norm rather than an error, an aberration. Even in a society used to the concept of rights, things aren’t moving quickly enough. What is Collins’ action part of? The idea that gay people are woven into the fabric of this nation. There are gay athletes, teachers, ministers, and soldiers. Gay athletes like Collins, straight allies like NFL punter Chris Kluwe, and organizations like You Can Play attempt to make coming out a personal choice. Heteronormativity leads people to assume that certain groups of people are always straight, or that it seems natural for them to be. There are pervasive stereotypes about LGBT individuals being deviant, hypersexual, or insufficiently masculine (or feminine). When “Don’t Ask, Don’t Tell” was being reviewed en route to its repeal, gays were portrayed as unable to keep their professionalism, and couldn’t keep it in their pants. It’s insulting. So Collins is a member of another, more neglected front of the gay rights struggle. When he came out two days ago it was national news. Part of the goal is that one day an athlete will come out, and it’s not a media spectacle. It’s just someone living their life. Author Andrew MackayPosted on April 30, 2013 Format LinkCategories UncategorizedTags athletes, don't ask don't tell, gay, heteronormativity, jason collins, LGBT, rights, you can play1 Comment on What is equality really about? A large industrial complex collapsed in Bangladesh on Thursday, with hundreds dead or stuck under the rubble. This was preceded in November by a massive garment factory fire that killed over a hundred workers. The fire started on the ground floor and spread upwards, leading several women to die after jumping from the roof, reminiscent of the Triangle Shirtwaist Factory fire, a disaster in 1911 New York that was a catalyst for many modern labor reforms. Worker outrage has led to direct action, something that is now common due to these disasters, as well as poor treatment and unpaid wages. These are irregular and difficult to control because of the issues creating organized unions. Bangladesh is the rock-bottom labor market, for companies that think China and Malaysia have grown too costly. As with many export-driven countries, the government has given manufacturers incredible deals on land and created long tax holidays. In addition, there is lax oversight and a strong independence of companies conduct business on their own terms. Local labor activists are walking a lonely road, in which the powers that be are set against them; they have been beaten, arrested, and even murdered for their efforts. Until labor organizations can exist free from corporate or government action, there will be another Rana Plaza. Even as I write this there are buildings cracked and creaking, full of flammable dust and lint, with the fire doors barred and filled with people working an insane amount for hardly any money at all. People who believe in labor justice should help support local workers create, expand, and use their collective power. Some organizations like the International Labor Rights Forum and the AFL-CIO are supporting and documenting the movement. If Americans and Europeans do not see themselves in these tragedies, it is only because our generations have not paid the price. The bloody actions against miners, railroad workers, and the same garment workers who leapt from their burning factory in 1911 mirror what Bangladesh is experiencing. This is not just chaos in the developing world. It is a chance to see the horrors that activists fought and died for to end. Matt Taibbi has released yet another feature outlining the fraud of a huge scale that large banks have engaged in. Rather than charge excessive fees or provide unrealistic mortgage terms, they engage in collusion to manipulate parts of the world economy so basic that most don’t know they exist. First was the LIBOR scandal. LIBOR is an important interest rate, set daily, that determines what banks charge each other for short-term credit. Each large bank submits a bid on what the rate should be, and the middle 50% of bids are averaged out to become the rate of the day. Since banks lend vast amounts of money to each other, colluding to adjust the rate (usually downwards) means billions of dollars in revenue for a bank’s currency and derivatives traders. Now, a firm called ICAP is being investigated for fixing an important rate used in interest-swaps. This has similarities to municipal bond-rigging (outlined previous by Taibbi here). Say you want to pass a large bond measure to build a hospital. Because you spend the money gradually over time, the money you haven’t spent yet gets invested through a broker, who sets up a public auction. The banks divvied up these bond projects among themselves before the auctions, then bid low interest rates. Billions of dollars were skimmed from the accounts of small towns and counties. The last five years are a swollen river of fraud- when the latest scandal is disposed with another, bigger one comes up. Banks haven’t just been stupid, they’ve engaged in old-school trust activity straight out of the Gilded Age. A friend did raise a point that I think is important. Did we really think that LIBOR, something set by a banking firm with the help of large financial institutions, was going to be competitive? Having such important things set by a private agreement is just asking to be disappointed. While it doesn’t detract from the terrible things these interest-fixing schemes have done to regular people and businesses looking for a loan, it also is a reminder that one shouldn’t assume that corporations are acting fairly when they deal amongst themselves. 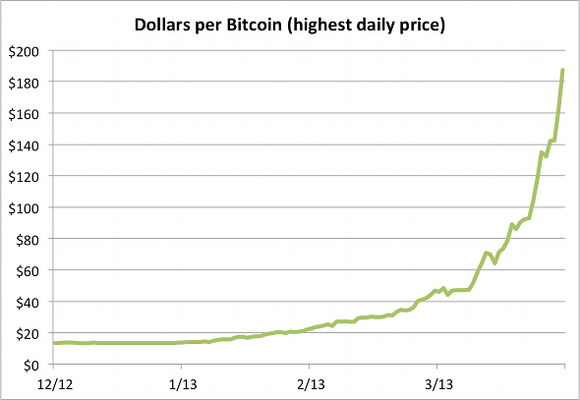 For us internet citizens, the story of the past couple weeks is bitcoin. It’s a virtual currency originally targeted towards anti-establishment libertarians and people looking to pay for things online that Visa and Mastercard won’t allow (read: illegal things). Ron Paul supporters who hate central banking, Wikileaks supporters trying to donate when major banks and credit card companies embargoed the site, and millennial hackers all got on board and kept the idea alive. One of my favorite moments of the 2012 Olympics was when in the middle of the parade, an unusual nation was represented- the Independent Olympics Athletes. In three Olympics people have, by choice or by necessity, not competed under the flag of a specific nation. The games has a way to deal with the war, politics, and division that the real world faces- if they qualify for an event they can petition to march under the flag of the International Olympic Committee. In 1992 Yugoslavia was collapsing, and the Olympic flag was a way to get around sanctions against the Federal Republic. In 2000 the end of the struggle to free East Timor was approaching, and athletes from there did not want to play for Indonesia. 2012 had three people who were stateless due to administration- when the Netherlands Antilles was absorbed by the mother country, they lost their Olympic committee. Since they didn’t view themselves as Dutch, they qualified as independents. The link is about Guor Marial, who was one of the Lost Boys of Sudan, left homeless during the decades-long civil war. He fled servitude and literally ran himself out of the conflict. He considers himself South Sudanese, but the new country didn’t form a committee in time. These athletes remind us on a large stage how people can be more than just homeless- they can be without a nation. It’s not just Yugoslavia, East Timor, and the Sudan, it’s also about groups such as the Rohyingya people who are forced out of their homes in Burma. The Olympic flag reminds us all of an obligation we have. When we see the stateless, that is our role. We are here to remember, we are here to make sure people are not forgotten.